In superstorm Sandy's wake, officials last year sought innovative proposals on how to increase resilience in communities and along susceptible shorelines. 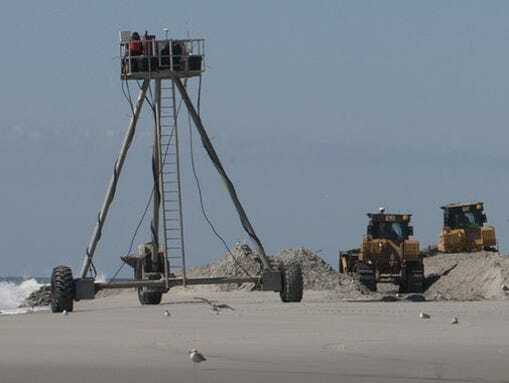 None of the six proposals awarded $930 million in federal funding during the Rebuild by Design competition focuses on Monmouth and Ocean counties. But governments are spending hundreds of millions of dollars to restore or upgrade more traditional protections aimed at reducing damages when the next hurricane or nor'easter strikes. Protections include rebuilt beaches and dunes and a new seawall, which environmental activists say will encourage more development in hazardous areas. About 20 towns, including nine in Monmouth and Ocean counties, are participating in a "Getting to Resilience" program, according to Lisa Auermuller, watershed coordinator at the Jacques Cousteau National Estuarine Research Reserve in Tuckerton. The program helps communities learn how to reduce vulnerability and increase preparedness. Sandy led to 38 deaths and caused an estimated $29.4 billion in damage in New Jersey, according to the state Hazard Mitigation Plan. Since Sandy, more communities are interested in reducing risk and boosting preparedness. Anthony J. Broccoli, a professor and co-director of the Rutgers Climate Institute, said "the risk of flooding from coastal storms is going to be changing dramatically over the course of the rest of this century and the risks will be increasing. That's not because the storms (have) changed. It's because the sea level is rising." The 10 Rebuild by Design finalists included a "Blue Dunes" proposal to build massive barrier islands off the coasts of New Jersey and New York that would reduce storm surges. Auermuller thinks it will take decades to become more resilient and "I wouldn't doubt it's going to take another storm or two for people to be convinced that we need to start thinking about … the coastal areas differently than we do now," including the natural environment. Jeanne Herb, Associate Director of the Environmental Analysis and Communications Group at Rutgers University's Edward J. Bloustein School of Planning and Public Policy, said "some communities have done some amazing work in terms of preparing themselves (for) the next storm." "It will take a concerted and coordinated effort over the next decade, with support and engagement at the community level on up, as well as support and engagement from the top down," she said. "It has to go both ways." Full story at the Courier Post.